Oscar Predictions 2014 – Win The Shawshank Redemption DVD! And yes, you’re reading that correctly. You will win a copy of The Shawshank Redemption. Family members ARE allowed to enter. If you don’t want the movie, re-gift it or choose someone you want it sent to. 1. Which film do you think will win Best Picture? 2. Who do you think will win best actor? 3. Who do you think will win best actress? 4. Who do you think will win best supporting actor? 5. Who do you think will win best supporting actress? 6. Which movie do you think will win best animated feature? 7. Which movie do you think will win best director? Feel free to add noms for worst actress, actor and quote as well. The top ten movies that make their fellow countrymen proud! This week’s (Feb 21-27/14) movie of the week is… Ip Man! If my friends in the Starks family happen to read this, I must acknowledge that there are a few people like them who collect citizenships and therefore have multi-levels of pride. This family legitimately calls three different (and great) countries their own. I also would like to acknowledge the inspiration for this blog entry. First, there is this week’s movie of the week, Ip Man, a story of a Chinese martial artist standing up against the brutality and abusiveness of Japanese occupiers in the southeast Chinese city of Foshan in the 1930’s. 10. The King’s Speech (2010). Maybe I’m basing this on my own experience, because when I watch this movie I want to be British. 9. Crocodile Dundee (1986). Admit it, you’ve watched, loved it, quoted the “That’s a knife!” scene and talked in an Australian accent for days after seeing it. 8. The Stone of Destiny (2008). This one doesn’t make me wish I was Scottish. It makes me so happy that my roots are. 7. Amelie (2001). We’ve already talked about this movie on this blog, but I have to put it on this list. I’ve seen great French movies but this one tops them all. 6. Das Boot (1981). I’ve said it before and I’ll say it again, this movie should be boring, but you can’t help but admit that it grips you from beginning to end. It also helps you look through the eyes of German soldiers during WWII. 5. Remember the Titans (2000). This one is highly inspirational. As for movies with American pride, I am partial to the ones that deal with human equality and rights, so I would put The Help and Freedom Writers and Lincoln up there as well. 4. Seven Samurai (1954). The Japanese are very proud of this movie, and they should be. Not only was this a dynamic and innovative movie that would set trends for decades to come, it also showcases the Samurai. These are warriors that I believe are something to be proud of if you’re Japanese. 3. Miracle (2004). This is by far my favourite hockey movie. Kurt Russell was at his best and each actor chosen was perfect for the role. Not only that, they captured the emotion, action and drama that went along with the story. 1. The Terry Fox Story (1983). Ok, so I had to put the Canadian one at #1. I had to! Congratulations Ip Man. This is your week. Best Actress: I’d have to say that this is a tie between Ellen Burstyn and Jennifer Connelly for Requiem for a Dream. This movie will bother you, but in a good way. Shocking, disturbing, and important. Not to knock completely what my friend David said, of course. It might not be for everyone, especially considering the subject matter and content. Best Actor: Donnie Yen for Ip Man. He’s like a quiet and hopeful Bruce Lee. Best Quote: “Hold fast to the human inside of you, and you’ll survive” from The Diving Bell and the Butterfly. We are all proud to be the nationality that we are. And I believe the highest form of national pride is the kind that embraces other cultures and does not place its own above others. Enjoy the rest of the olympics everyone. Did Carl suffer from depression? 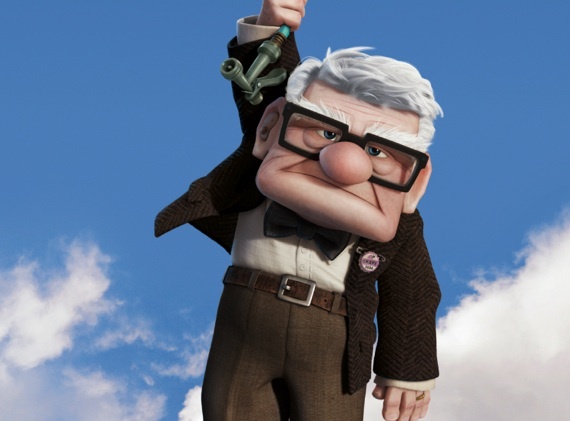 This week’s (Feb 14-20/14) movie of the week is… Up! I’ll never forget my first genuine face-to-face experience with a clinically depressed person. She was a teenagers in a youth group where I was a youth pastor. I was only there a year but Joy and I got to know her and her mom very well. She was a delightful young lady. She welcomed me to the group by pushing a piece of over-frosted cake into my face and up my nose. She was pretty, smart, had a great sense of humour, and seemed to get along well with her peers. But many mornings she couldn’t even get out of bed because her depression was so strong. Sometimes on youth trips she would have to leave with another adult and get a good cry out. I didn’t understand depression then. I knew that there was something to this sickness but I just didn’t know enough yet about it. Some of the young men in the group would say things like, “She just needs to quit being lazy, get out of bed, and cheer up.” I felt they were being judgmental and mean by saying this about her, but I couldn’t figure out how to answer them. I am very sad to say that it was just a few years ago that I found out this wonderful young woman died. She had committed suicide. That experience was almost twenty years ago. It still pains me to think about it. I am haunted by thoughts of what I could have done to help. Perhaps you have a similar story. By now, most of us understand that depression is real and debilitating. But we still have more to understand and more grace and compassion to learn. It’s funny. For some reason we seem to have a kind of phobia when it comes to troubles with the brain. If our arm is in a sling, we would be glad to tell others the story if they ask. If we have diabetes, people would probably find out pretty easily, and that wouldn’t bother us really. We’d probably get asked questions that we would answer without thinking anything of it. For Pete’s sake, even if someone has irritable bowel syndrome we’d talk about that with maybe a bit of a red face, but nothing more. But if we suffer from an addiction, depression, or some kind of brain-stress-related sickness, then forget it. We’re not sharing that information. That’s personal! Now Up is a very happy movie. It’s sweet, fun, funny, and sad at times, but I wouldn’t say depressing. But this character, Carl, I believe is one who we can all identify with. He’s a grumpy old man, but we don’t mind. Mainly because we see his history, which is a beautiful and sad story. We don’t start hating him in the movie because he’s a grumbling sourpuss. He even hurts someone physically when acting out on his emotions that stem from the sting of having lost a loved one far too soon. Depression does that. We hurt people around us. It may seem a bit far fetched to consider Carl as a mental health sufferer, but none of us can truly appreciate the hurt inside of this character as he deals with loss. In this story, Carl had some people and circumstances that helped him deal with his angst. On the one hand, he’s lucky. We don’t all have that. But on the other hand, he is a man of action and he brought those factors into his life. He felt the need to get to Paradise Island so strong that he figured out a way to make his house float in air. We all need to be people of action too. Sometimes it takes getting counselling, which is actually something we all should do, and do often. If you’ve never had professional counselling, just three sessions would be more than worth the money. Expensive? Yes. But so is dental work and eyeglasses. Take action. You’re not crazy. You’re human. Congratulations Up. This is your week. Best Actress: Freida Pinto as Latika in Slumdog Millionaire. In fact, all of the actresses who play this character in different stages of her life are worthy of the best actress acknowledgement. Best Actor: Matt Damon. I forgot how much I loved Good Will Hunting and I forgot how great he was in this film. I was reminded of it one day last week when fixing a sofa at a home where the customer was watching it. Best Quote: “If you ever disrespect my wife again, I will end you!” – Sean Maguire in Good Will Hunting. I realize this is a Valentine’s Day themed MOTW, so Happy Valentine’s Day everyone. Make sure that you don’t disrespect my wife–or I’ll call Robin Williams. A couple of days late here, but I just couldn’t miss the opportunity to honour this great movie icon. Like everyone else I almost exclusively remember her as a child, but that’s ok. It’s a memory she and her surviving family can be proud of. A memory of a little girl who sang, danced and acted every bit as good–or better–as Debbie Reynolds, Gene Kelly or even Justin Timberlake. And she, like many others in the entertainment business, broke through the colour barrier, dancing and singing with people of varying shades of skin during a time where racism ran rampant. Truly one of the greats, and she did it all before she even turned ten. Who has the best love story? In an unprecedented and gutsy move, I have selected SIX movies to choose from for this week only. So who’s is the best? If you find it too tough, feel free to vote for your top two.